If you’re like most people, your work email account is an absolute disaster—most likely some unholy combination of short messages with friends, formal interactions with coworkers and higher ups, client emails, and various other outside communications. Slack wants to move all your office conversation and collaboration into its own, easily searchable world. So while it’s not quite an “email revolution,” Slack does want to make your office chatter that much easier. Slack aims to simplify three main things: messaging, file sharing, and the ever-present universal search feature. The app carries all the alerts and notifications you’re used to, as well as the convenience of syncing all your devices anytime you make a change. The main difference is how you interact with your coworkers within slack. You can share, serve, star, and comment on pretty much anything that makes its way through your inbox (images, PDF files, lines of text, Google documents, etc. And all this gets totally indexed, so you can find pretty much everything you could possibly want to look through in one place—a true universal search, if you will. We’ve all gotten so used to having everything mashed into one place. And the great thing about Slack is that it doesn’t entirely change that concept, but it does make it immensely easier to sort through all the clutter. By creating a constant stream of conversation with coworkers, we get the huge dumping pot of text, email, images, data, etc. that we’ve grown to depend on, for better or for worse, but now we can actually find things in that dumping ground. New messages get highlighted, so when you’re like through a stream of conversation, you’ll know exactly where you should be looking. 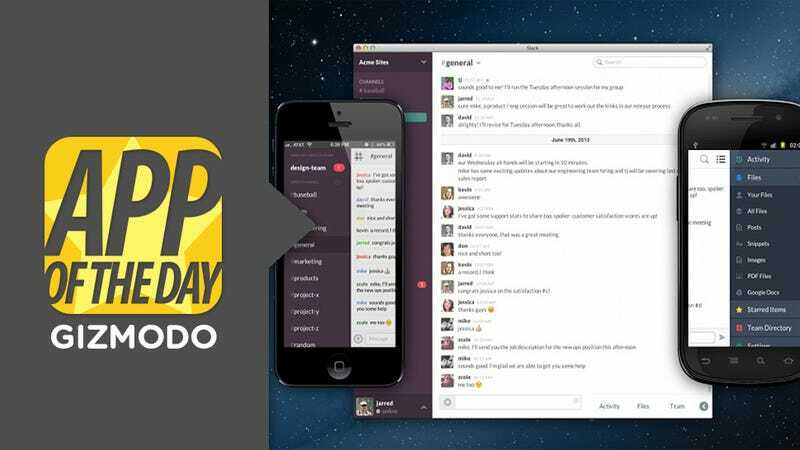 Plus, unlike some other contemporary email clients, Slack comes with a desktop version, so once you get in a routine, you can keep it—no matter if you’re on the go, at home, or in the office. Currently, that app is only available to a select number of beta-testing groups, but interested parties can sign up online starting today for their chance to test out a new way of communicating at work.